When I first heard about Pillow Talk, the wearable device that lets you stream the sound of your heartbeat to a loved one’s pillow, I couldn’t decide if it was bonkers, genius or somewhere in between. But after talking to Joanna Montgomery, founder of Little Riot, the company behind the product, what is clear is that the startup’s journey is just a little insane. Five years after the concept went viral, several investors, a near bankruptcy and multiple failed manufacturing partners later, the device is finally launching on Kickstarter. Little Riot is aiming to crowd fund £75,000 to bring the wearable to market, with early backers receiving devices in May next year. 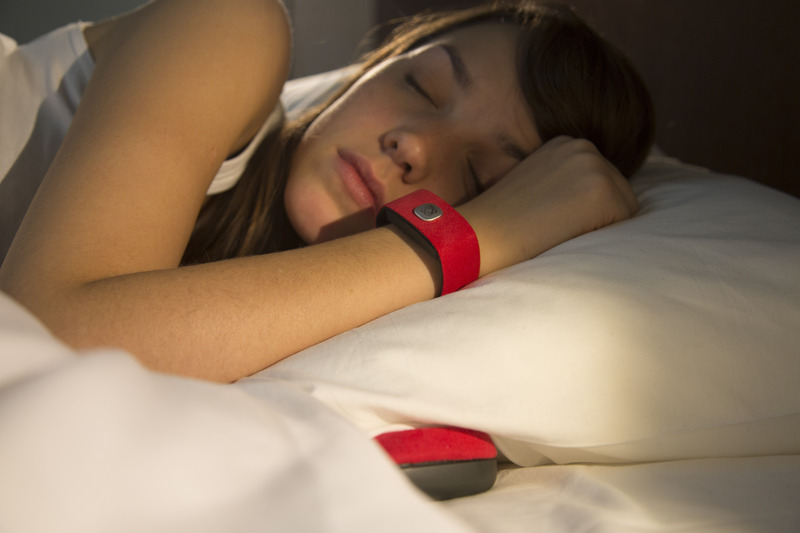 The product itself consists of a wrist strap coupled with a mobile app that monitors your heartbeat and streams it remotely to a tiny speaker that can be placed under the recipient’s pillow. Asked to come up with a new product idea for a University exhibition back in the Summer of 2010, just a few years after the iPhone had launched, Montgomery says she was struck by how reliant interactive design had become on pressing buttons or swiping touch screens. And that somewhere along the way the excitement of interactivity had been lost. This led to her thinking of ways to bridge the gap between how people interact digitally and when they are physically in the same room, specifically in relation to a long-distance relationship, where something like a Skype video call can feel unnatural and contrived compared to just being in someone’s presence. “I find it strange that we just accept technology like that,” she says. “It’s completely different to actually being with somebody and doesn’t fit into our lives”. A video of her Pillow Talk concept went viral seeing nearly 50,000 people register their interest, demonstrating that there is pent-up demand for alternative ways to connect remotely to a loved one. “That’s what still keeps me up at night,” says Montgomery, although she never planned to start a company, noting that startup kool aid was in short supply in recession-hit 2010. Joanna Montgomery at 2013 FDM everywoman in Technology Awards. As word spread, Montgomery won a £25,000 U.K. government grant to build the first prototype, which led to another prototype and then another. Then in Summer 2012, Little Riot raised seed funding from a VC based in Newcastle, U.K. to help turn the idea into a fully fledged startup and hopefully bring the device to market. But doing hardware is hard and, after making a few important product changes, such as ditching ring-based pulse detection for something wrist-based, by Christmas 2013 and for reasons unknown, investors pulled out. This left the startup with convertible debt that its VCs were calling time on, bringing Little Riot close to bankruptcy and making it almost impossible to raise further funding. It also had a negative impact on Montgomery’s own finances and health. And of course the product was delayed again, perhaps indefinitely. “The hardest part of ‘doing a hardware startup’ is people always asking what’s taking so long,” says Montgomery. “Well, something didn’t work and now we need to reinvest the time and money to have another go. We can’t just commit another version of the code. The other issue is that there’s no MVP for hardware, companies like Apple who create beautiful products with beautiful user experience sent that ship sailing for us”. Finally, in late 2014 an unlikely hero came to the rescue in the form of a corporate accelerator and a lawyer. Specifically, Little Riot applied to Telefónica’s Wayra academy and was accepted onto the programme. It was there that Wayra’s Head of Legal, Stuart Griffin, “saved my company,” says Montgomery, by helping to neutralise the startup’s rogue investor, even though they remain a minor shareholder. “I’ve made more progress this year than I made in the previous 4 put together, just thanks to the way they’ve pushed me and challenged me,” she says of Wayra. Little Riot also now counts Yonatan Rad-Frizman (CEO of Kano) and Aza Raskin (VP at Jawbone) as advisors. You can back the project on Kickstarter here.